Looks really good like the Animal men. I think the dinosaur could represent Savage having a bigger role to play in the larger Valiant Universe. I don't really see them using the Gold Key license anymore but I was fond of the robot therapist/cyber noir take for Magnus and the 20 year old schmuck take for Doc Spektor and wouldn't if Valiant ran with those. Rags Morales is back is an interesting piece of news. I look forward to his new contributions! X-O Manowar being renumbered, or nearly any flagship book, always will be a boo/hiss from me. Volume 1 run=50 issues, Volume 2 run=26 issues, lets not expect volume 3 to make it much past 14-16 issues. 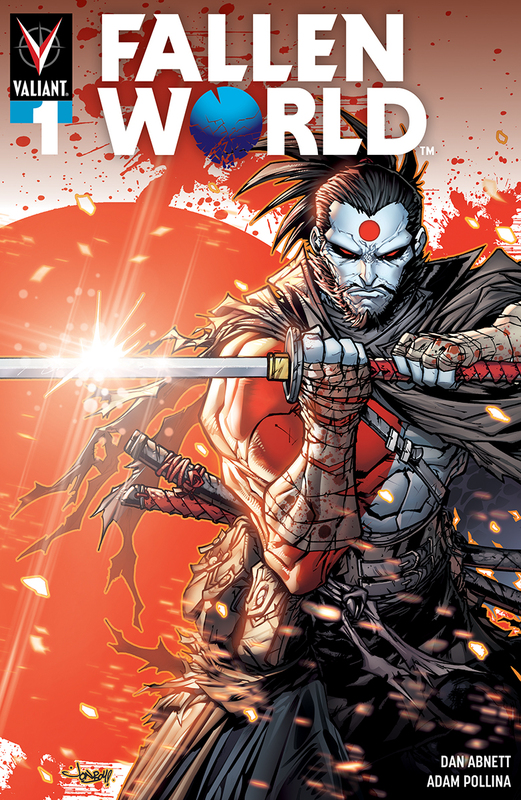 They are already at that point with Bloodshot and Ninjak the two other dominant characters in the VEI fold. Fallen World with Rai has me excited. Title makes perfect sense given where we last left off with the future of the VU. I was thinking today about the upcoming Life and Death of Toyo Harada mini, my personal most anticipated comic book of the year, and went to the Valiant site to refresh my memory on some details. I was surprised to see that neither Generation Zero nor Harbinger Renegade made it to ten issues. (I stopped following them after a few months - I have a pretty high bar for what's worth the considerable expense of buying comics.) Were those planned as shorter runs, or does Valiant just have a really itchy trigger finger these days when it comes to canceling titles that are selling less than they want? For that matter, what are Valiant's currently published titles? I've been out of that universe for a couple years, and the site's list of all their titles lacks any obvious way to filter for what's current, which is an odd oversight. Just curious, more than anything. Valiant has gotten into a mode of mini/mini/mini and 12-16ish titles for most books not named XO. Different titles would mean different reasons. I personally don't like it but sometimes, when sales is the reason, I can't argue. Other times I'm must annoyed(like with Ninjak and XO ending...again). Current mostly books are not the 8-9 titles we were told was the plan by Dinesh just a few years ago. With mgmt turnover it is even less so, if they even acknowledge that that was once a goal. We have no books for Shadowman(just ended at #11 Jan 2019), Quantum&Woody(ended at #12 Dec 2018) or Renegades on the horizon. The following characters have been nearly absent or barely touched on in some time: Archer/Armstrong, Ivar, H.A.R.D. Corps, Savage or Divinity. Characers we've been teased like Psi-Lords seems likely to never happen at this pace let alone returning to Britannia. Valiant is in a place I'd deem "uncertain" and as a fan of their characters I don't like having to say that. Yikes. That does sound... troubled. Their planned movie slate is sounding more quixotic in that context. Thanks for the details, Cap'n. I really wish Netflix would have boght them instead of Sony. I've long thought Harbingers/Imperium would make a terrific ongoing series. Or a movie / movie trilogy. I am fine with that also. I'm disappointed that its an "in name only" launch of the property, much like Unity. The original concept should be honored and updated as needed for the current climate of the characters. What we are getting is something else with the Psi-Lords name slapped upon it's banner head. Now, that said, the concept I read sounds intriguing and I'll read it regardless just with they branded it with a new IP and not Psi-Lords. Also, does the black female resemble the actress Sonequa Martin-Green(Walking Dead/ST isc) to anyone, it does to me. Makes me wonder if the others are possibly modeled on actors as well. Oh man... these Psi-Lords designs look like parodies.